This promotes a classroom environment where students work together as a team to maintain a productive culture as well as enforces employ-ability skills throughout the semester. 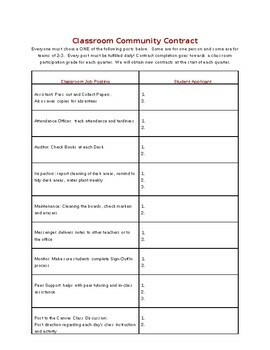 Students must choose ONE of the following Classroom Jobs listed in the chart. Some are for one person and some are for teams of 2-3. Every job post must be fulfilled daily! Contract completion goes towards a classroom employ-ability grade for each interim and quarter. The teacher could allow students to keep the same jobs throughout the semester or obtain new contracts at the start of each quarter. NOTE: I used in grades 9-12 but can be adapted for all grade levels. 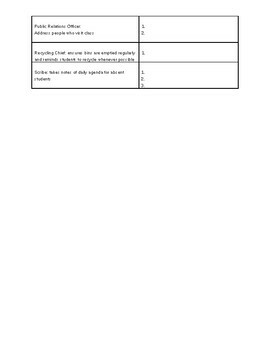 FYI: Students could also complete my Employ-ability Multi-part Project (which is also available in TPT) before or after to prepare resume and job research as well as go through an actual interview process for the jobs listed.